elli & nels *in stitches*: KCW and Getting Skinny! I posted about my sewing goals before, but along with those comes a personal goal - to get more involved in the sewing communities online. One of the ways I'm doing this is via Facebook, where I'm a member in several sewing and designer's groups. Another is by linking and connecting with other blogs and personal websites via my blog, such as using the "buttons" on my sidebar. Tonight I'm adding two - KCW (Kid's Clothes Week) and the first ever Getting Skinny! sewing swap. I've read about KCW but never participated, so this is a first for me. My user profile is here, and I'll be posting photos of my project(s) there! If you've been debating on joining in yourself, do it - we all can use that little bit of extra motivation that an organized event gives us, right? The Getting Skinny! sewing swap is hosted by Amy from Amy Made That!. I discovered her blog just tonight! - following a recommendation from another person on a Facebook group I belong to. I read about the sewing swap, and it sounds like so much fun! How could I resist? I'll be making a skinny pincushion (free tutorial here) and sending it off to another participant somewhere in the U.S. - and someone else - could be in the States, could be international - will be sending me one! (I might be finding some other little presents to include as well - we'll see!) 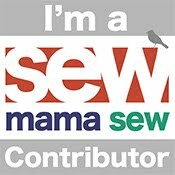 If you sew, go to the blog and email Amy to join in! Sign up is open until January 31st! Tomorrow I'll post a few things I've been working on (and hopefully finishing tonight!) Plus, the final stage of the SewCanShe log cabin sewalong is coming up on Wednesday - need to finish up my second set of blocks. :) Back to work! I'm glad too, can't wait! !